Other workshops are available on the Creative Expressions weekly workshops site. Ribbon: Various Ribbon Codes Available. 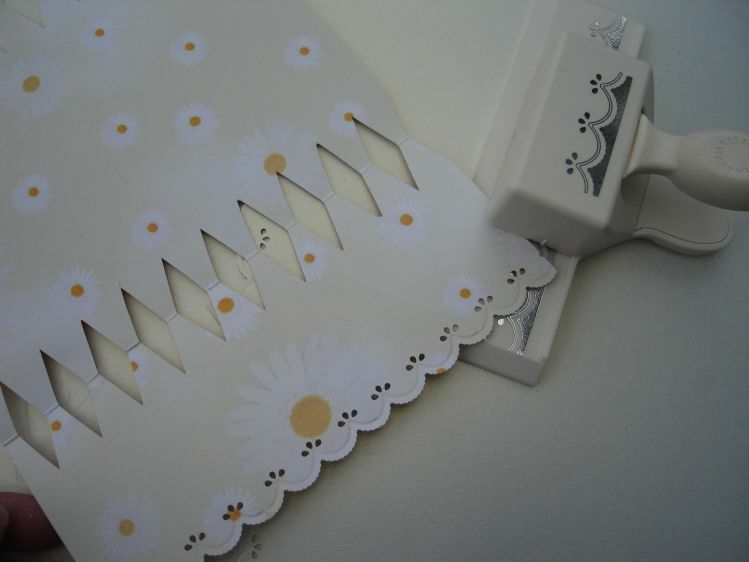 Scissors, Beads, Paper Flowers, Haberdashery Braids & Decorative Border Punch. 1 The cracker template has been designed to work with so many techniques. This worksheet will give you a few ideas. 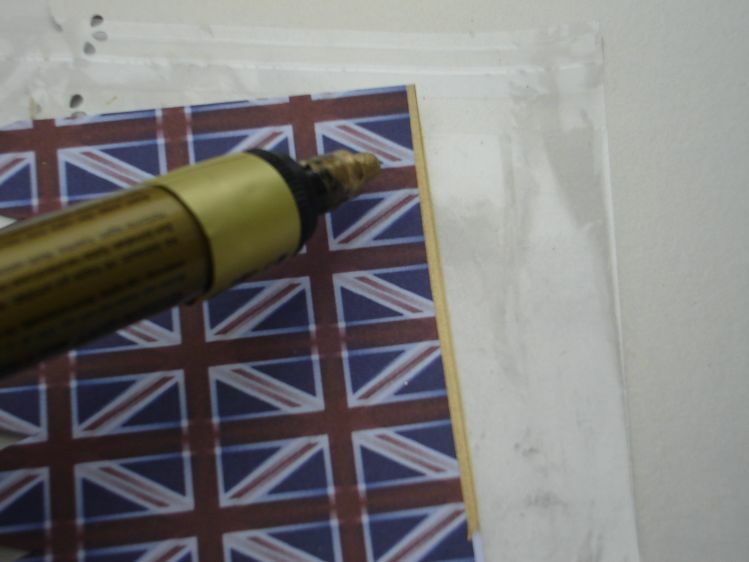 Print the design on an A4 sheet of 160sgm card & cut the cracker shape out. Apply Wonder tape to the 2 short edges. 1a. 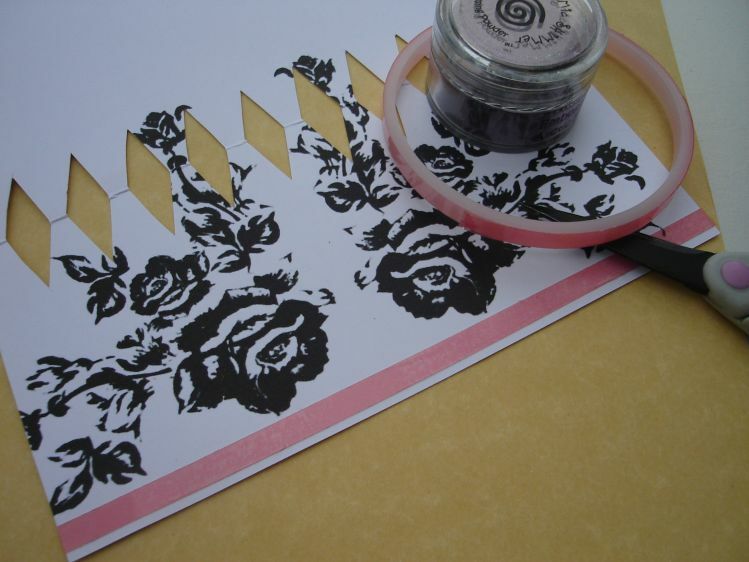 Sprinkle embossing powder onto the tape, then emboss. 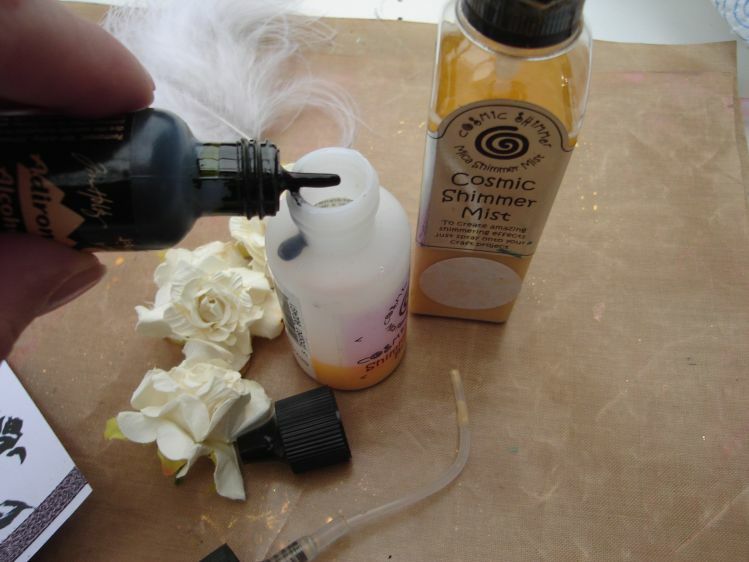 2 Place some sunlight cosmic shimmer mist into an empty mister and add a few drops of pitch black alcohol ink, mix the products together. 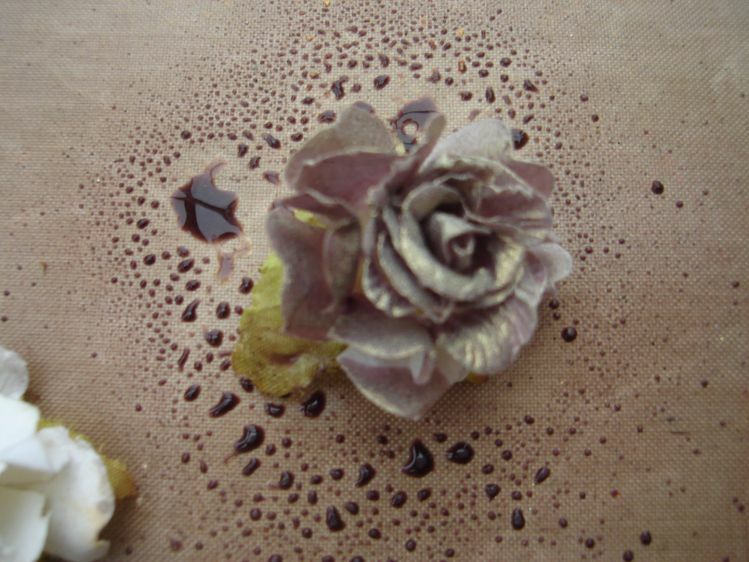 2a.Spritz the flowers required and allow to dry. 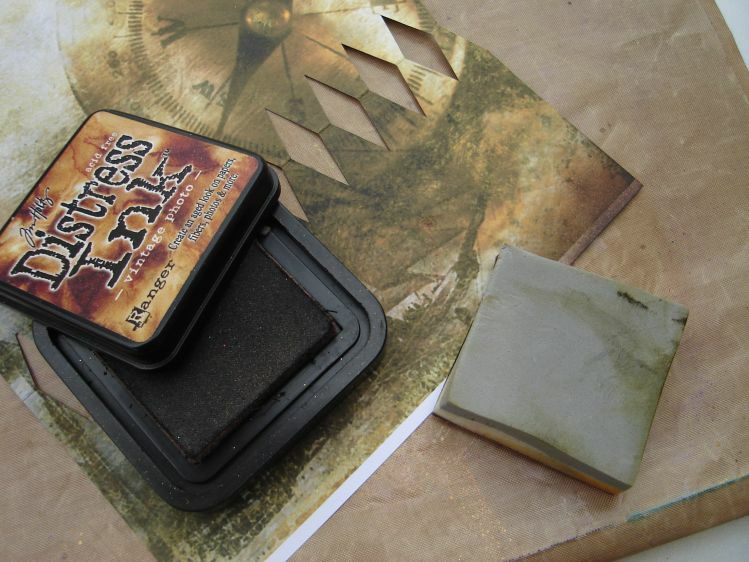 Although the mixture doesn`t produce a black shimmer as I had planned, it did create a stunning vintage feel, so worth playing with different colours. 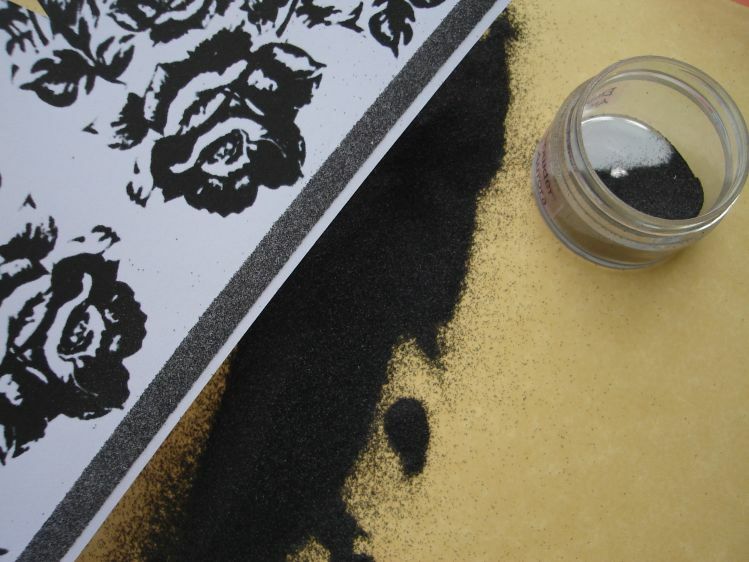 3 Distress the edges of the cracker using the cut`n`dry foam and black soot distress ink. 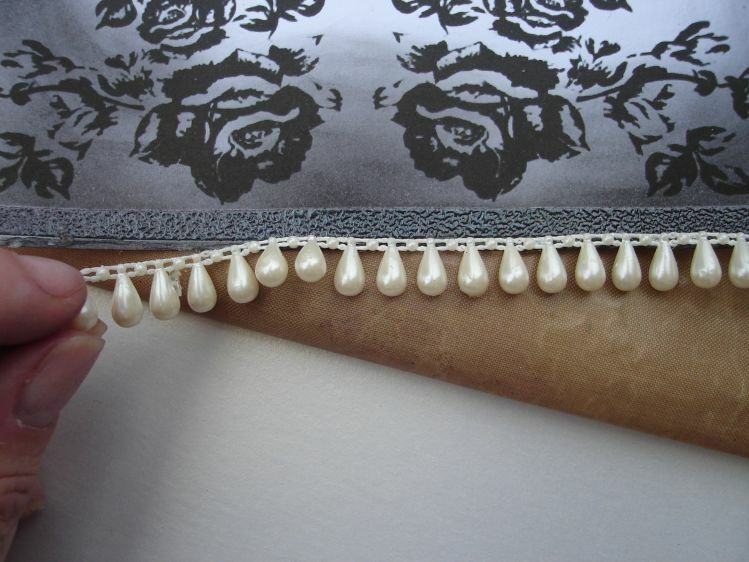 Attach a row of pearls to each end of the cracker and allow drying time. 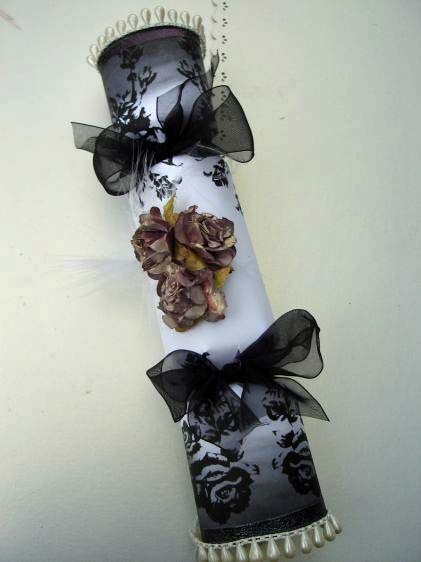 4 Finish the cracker as per the instructions and add black ribbon complement the design. 4a A close up of the cosmic shimmer flowers. 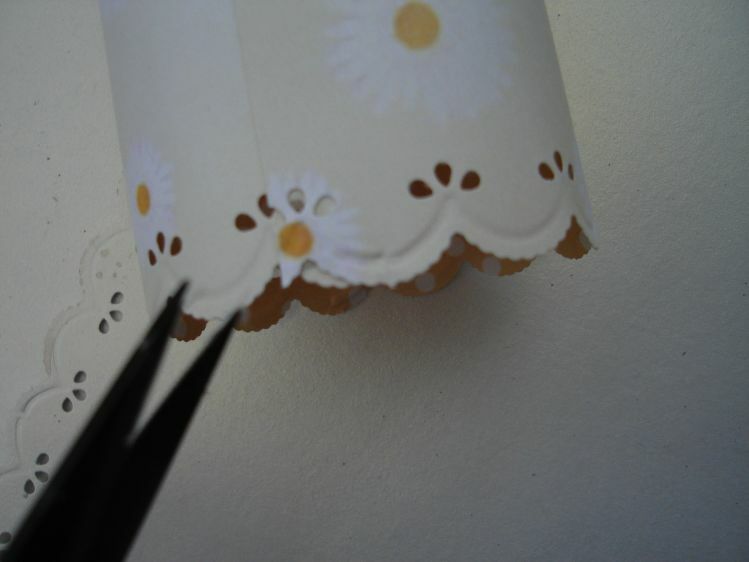 5 Take a printed backing paper, as with many printed pages where will be a white border, so take some cut`n`dry foam and vintage photo ink and distress the edges. This will give the full use of the A4 length needed for the project. 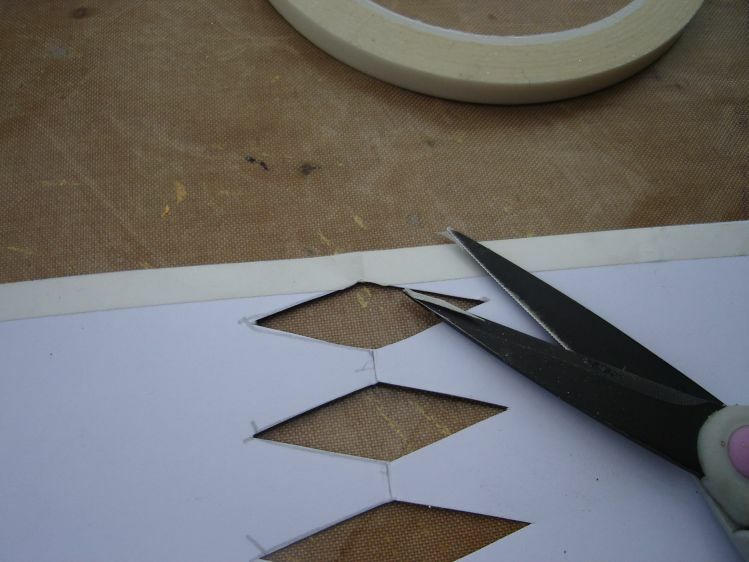 6 Ensure the double sided tape doesn`t cover the diamond cut out, if it does just snip the excess off ready for the cracker to be closed. 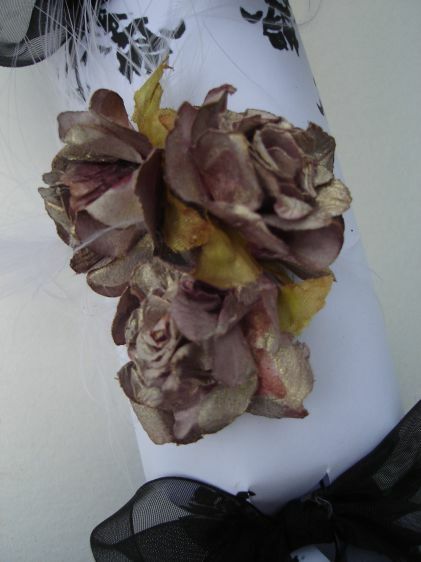 7 Edge the chosen paper with a gold pen to give a neat finish or add a peel off for a similar look. 7a. 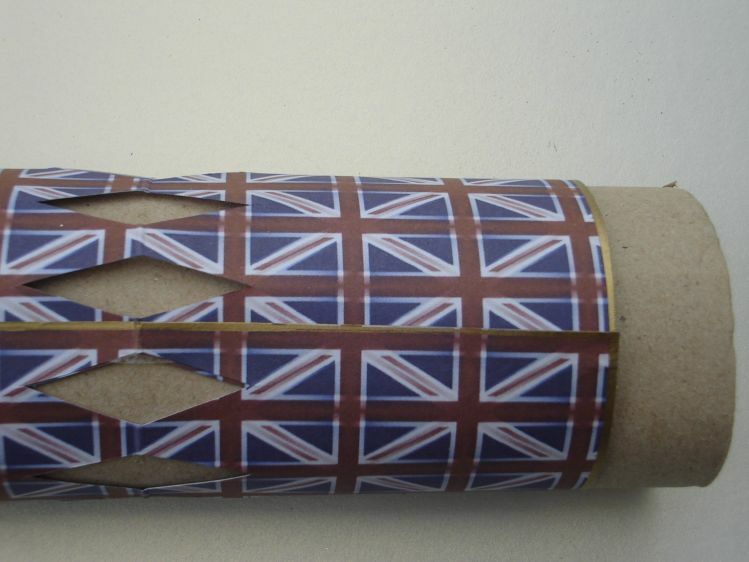 Place an empty kitchen roll tube inside the cracker to give a firm base to press the cracker closed. 8 Try making different styles with a man’s theme. 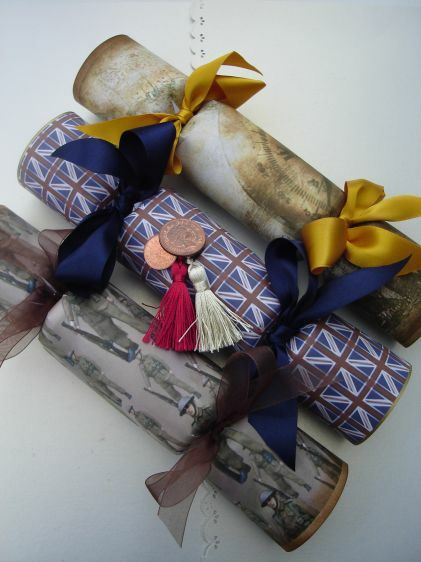 As the cracker is perfect for adding a gift voucher or money for that difficult gift. 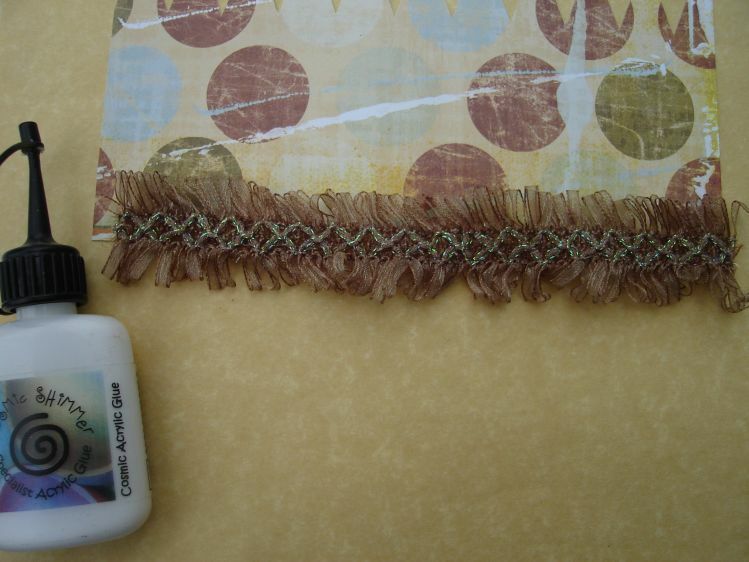 9 To use a fancy ribbon or lace, add a line of cosmic shimmer glue to the edge of the cracker and lay on the ribbon. 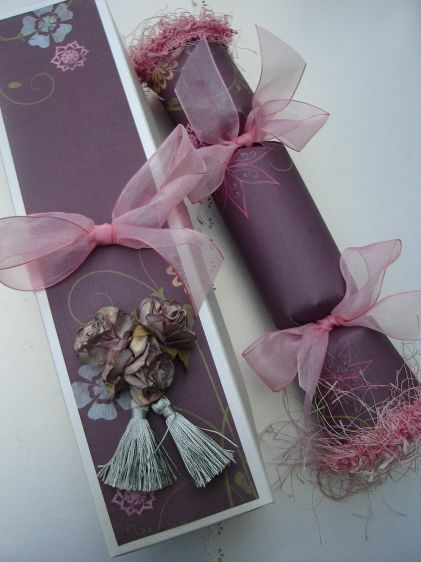 Allow to dry before completing the cracker. 10. 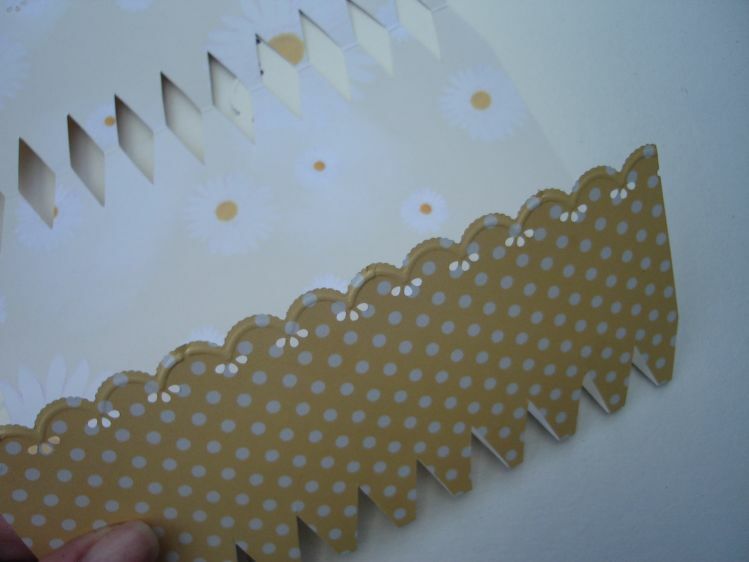 Punch a decorative border along the cracker edge. 10a.Use an A4 paper that is double sided as this will be seen at the ends. 10b.You may need to snip the end to join the shaped edge. 10c. Decorate the cracker as you require. 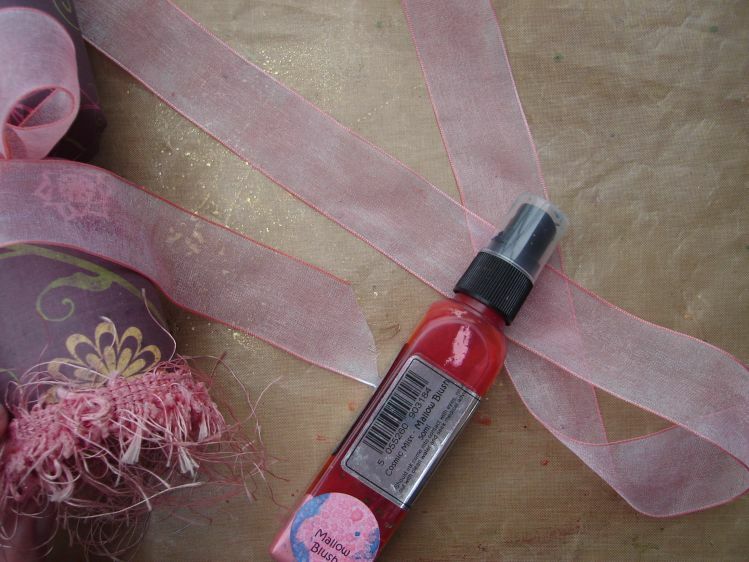 11 Spritz some organza ribbon with a cosmic shimmer mist to complement your colours. 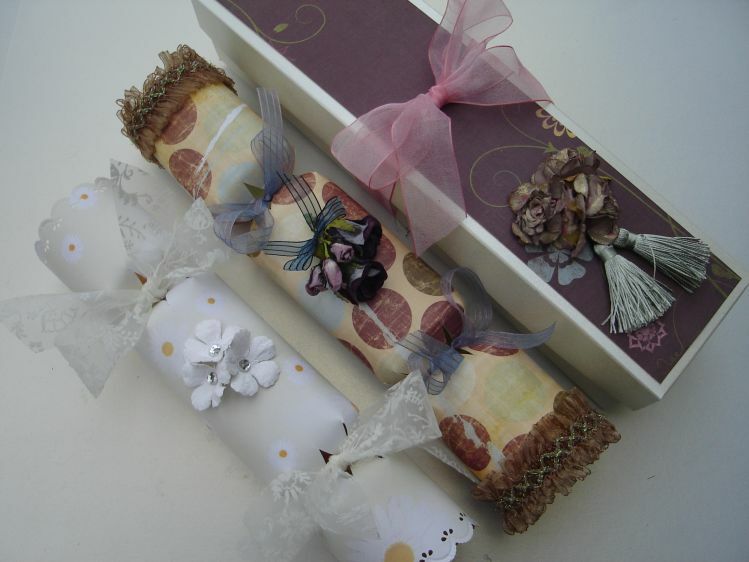 12 For an extra special gift make a box to complement the cracker as they suit a special occasion – please see the cracker section on the Creative Expressions Weekly Workshop site for the box workshop. 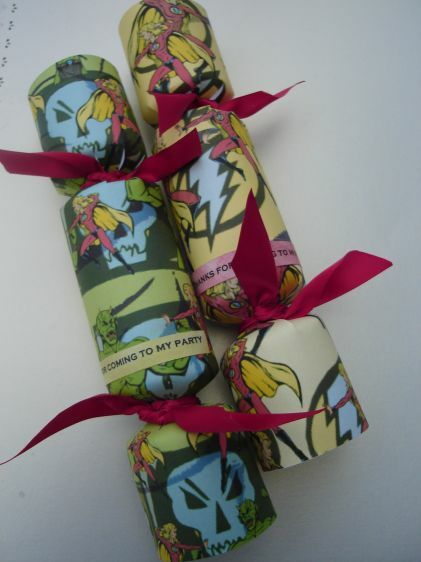 13 Use character backing papers to theme the cracker for a children’s party. 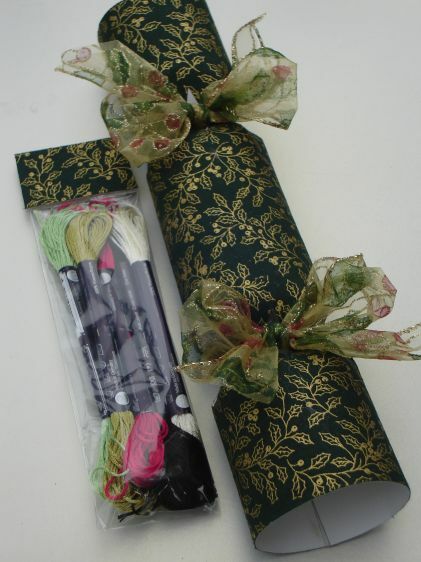 Use the cracker instead of a party bag and fill with goodies or chocolates. 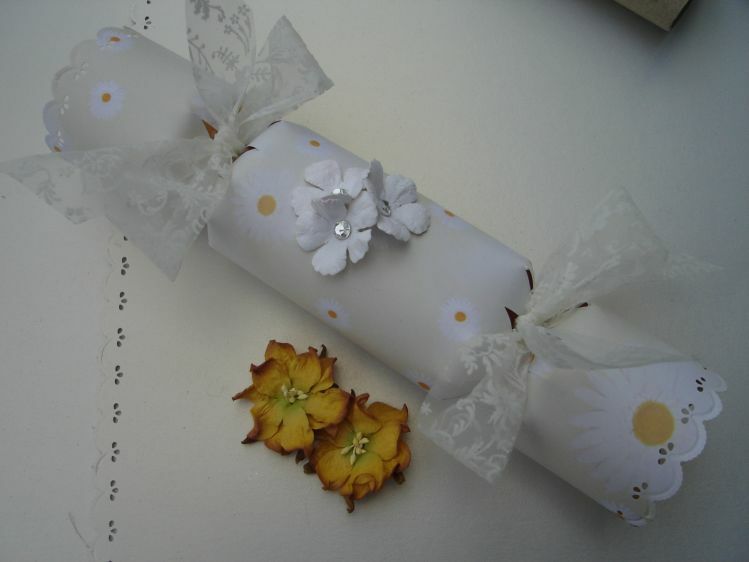 Type and add the words ` Thank you for coming to my party` on the outside of the cracker for a nice finishing touch. 15 There are other workshops on the Creative Expressions Weekly workshop site. This entry was posted in Cracker Template & Ideas. Bookmark the permalink. Thank you Suzanne for more brilliant ideas and techniques. I will have to become a stay at home pensioner to have enough time to do all these wonderful projects, but for now I’m still running my own business. By the way – you are not married to the house – are you??? Much love from another Mother with a lovely daughter! (35)! Another fantastic project, Suzanne and I understand you designed the cracker template- clever girl!